This morning we toured the LiveWell rehabilitation center, an interesting concept developed by Dr. Aravind as a new business that branches out from their core activity of running the Aravind Eye Hospital and associated training (LAICO) and manufacturing (Aurolab) activities. The idea here is to provide a single location for people needing medium-term residential rehabilitation care, e.g., after a stroke or surgery. 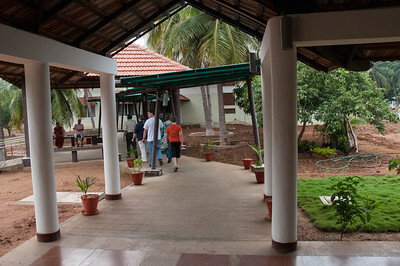 This new facility is located on the outskirts of Madurai, a peaceful setting in an old mango orchard. It includes residential rooms for about 30 patients (each with a companion), dining, and a full range of rehabilitation services. For Rs1500 per day (about $27), all inclusive, the patient and a companion family member are provided room and board and daily rehabilitation (physical therapy, occupational therapy, speech therapy) according to a personalized plan. In a country with a fragmented acute-care system, this holistic model is extremely appealing. We came away very impressed.